What Else I Read In is a monthly post featuring books I read during the month but did not write a full review on. If you have a similar post leave a comment and a link and I will visit to see what else you read. Also on your post leave this link back to my post so others can also share. Lyon's Bride by Cathy Maxwell - This is a slightly different romance. Long ago a Chattan male handfasted to a woman but after a year married someone else. The woman killed herself and her Mother cursed all Chattan male. They will die shortly after they fall in love. Neal Lyon wants a family but does not want to fall in love. Of course he does and with the woman he hires to find him a bride he cannot love. This is book one and the curse has not been broken. Neal has a brother and sister so the story will continue with their books. This was a quick fun read and I will be looking for the next two books in the series. Sunrise Point by Robyn Carr - I won this book in a contest at Marlene Harris's blog. This is the first Robyn Carr book I have read. It is book 19 in the Virgin River series. This is not my normal choice for reading so bear that in mind when you read this. At first I found the book a little preachy however after I got into the story it was better. The story was good but I was puzzled by some parts that seemed to have nothing to do with the story. I never knew why we had to hear about Luke, Cooper and Jack. They had nothing to do with the story line and interrupted the flow of the book. Even though it is book 19 it could stand alone. I could tell that some of the characters were from previous books but it did not cause any problems in keeping up with the story. It was a nice story but after reading I was satisfied to leave Virgin River behind. Frommer's Alaska: This was an Amazon Vine pick. I am going on a cruise to Alaska in September so I picked this up to help plan my stops. After reading I will plan non-cruise trip next time. Death of a Kitchen Diva by Lee Hollis - I won this book on Library Thing. It is the first book in the new Haley Powell Food and Cocktails Mystery mystery series. Hayley Powell is a great main character. She is a single mother who works for on of the local papers in Bar Harbor, ME. When she asks for a raise her boss offers to pay extra if she will write a food column. Her column is immediately popular and Karen Appelbaum, the food writer from the other paper, does not take Hayley's entrance kindly. When Karen is murdered Hayley's is the main suspect. The book is fun, the story interesting, the characters well drawn and fun. There is even a small love interest that may lead somewhere. I loved the recipes and the sorbet one is a keeper. Great result for a new series. Underground by Kat Richardson - Audio Book - This is the third book in the Greywalker series. This series is growing on me. I loved the change in Harper and Quinton's relationship. The monster was a real monster and it took a lot to find and get rid of him. All in all a really good listen. I already have the next audio book started but will be looking for books four when I am ready for a new audio book. Angels' Flight by Nalini Singh - I started this last month but managed to bury it under part of my TBR pile and forgot about it. I just found it and finished reading the last two stories. I enjoyed all the stories, even re-reading the ones that were not new. The Third Scroll (Hardstorm Saga) by Dana Marton - This was a TT post as well. The story of how the book got published is almost as interesting as the book. This is a good story full of action and adventure and with a strong main character. Tera tells the story in the first person. Her words fill the book with tension and adventure keeping the story moving. I am looking forward to the next two books in the series. Angel of Europa by Allen Steele - This is a short 90 page story published in hardcover. It is a quick read with a twist at the end. It is set in space and on Europa but is more mystery than science fiction. I like what Allen Steele writes and I enjoyed the this story. 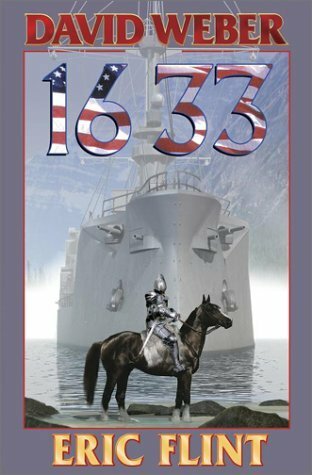 1632 by Eric Flint - This is a series I started and then lost out at some point. I really like the books so I am starting it over and plan to finis some time this year. On thing a audio book forces me to do is listen to every word. When I read I will often get impatient and skim. Sometimes I miss out on something important when I do this. Can't do that with a audio book. On the cover of Master of None by Sonya Bateman it says “Nobody ever dreamed of a genie like this. That is so true. Gavyn Donatti is the world's unluckiest thief. Just ask all the partners he's lost over the years. And when he misplaces an irreplaceable item he was hired to steal for his ruthless employer, Trevor—well, his latest bungle just might be his last. But then his luck finally turns: right when Trevor's thugs have him cornered, a djinn, otherwise known as a genie, appears to save him. Unfortunately, this genie—who goes by the very non-magical name of "Ian"—is more Hellboy than dream girl. An overgrown and extremely surly man who seems to hate Donatti on the spot, he may call Donatti master, but he isn't interested in granting three wishes. He informs Donatti that he is bound to help the thief fulfill his life's purpose, and then he will be free. The problem is that neither Donatti nor Ian has any idea what exactly that purpose is. At first Donatti's too concerned with his own survival to look a gift genie in the mouth, but when his ex-girlfriend Jazz and her young son get drawn into the crossfire, the stakes skyrocket. And when Ian reveals that he has an agenda of his own—with both Donatti and the murderous Trevor at the center of it—Donatti will have to become the man he never knew he could be, or the entire world could pay the price. . . . While the story is dead serious it is serious with a big touch of humor. Characters: Gavyn Donatti is a great character. You get his backstory and get to watch him grow and change. Ian is a hoot. As it says he is big, surly and hard to like at first. He is also funny even though he does not mean to be. Jazz is great. She and Gavyn have a past and it keep the tension going. There are more side characters than I can list, most very well developed, and most have a big part in the story. Since this is the first in the series I would guess that they will all have a story later. Plot: Everything that happens follows in order but not necessarily what I expected. In some ways the plot is like a onion. It has a lot of layers and they peel back a little at a time. It keeps the action interesting and full of surprises. Worldbuilding: This is a debut novel and Bateman has done a masterful joy of building a paranormal world none of us see but it is right here where we live. Expect several surprises. Tension: It starts out with tension between Gavyn and Ian and as that tension eases more builds and builds in every direction. There is tension caused by past actions, tension because of the bad guys, tension in the everyday world and a lot of tension caused by the actions in the paranormal world. The book surprised me. When I read that Gavyn found a genie I did not expect what he got. Once I got over my expectations I loved everything about the book. It was not a fast read but well worth the time. The second book Master and Apprentice came out in 2011. I have that one on my wish list. Pocket Books published Master of None by Sonya Bateman in 2010. I have been following the Maiden Lane series since it started. Thief of Shadows by Elizabeth Hoyt is due out June 26. I am anxious to see how she handles Winter Makepeace's story. "She reminded herself, very firmly, that being disarmed in the presence of Richelieu was the one thing she could least afford. For all his brains and his charm, the cardinal was almost certainly the most dangerous enemy her nation faced at the moment." Short and sweet answer! I only go to the dictionary if I cannot get the meaning from the context around the word. This week I just got 4 books. I am still working on my TBR pile. From Amazon Vine: Dream Lake by Lisa Kleypas - This is the next book in the Friday Harbor series. Used from Amazon: The Moon is a Harsh Mistress by Robert A. Heinlein - This is our Science Fiction Book Club selection for June. None of the three libraries in my area had a copy and it is not available as an ebook so I ordered used. A Night Like This by Julia Quinn is the second book in the Smythe-Smith Quartet. I received an eARC of A Night Like This from Edelweiss. Both Anne Wynter and Daniel Smythe-Smith were introduced near the end of the first book. I guessed they would be the two to be featured and I was right. "Anne Wynter’s job as governess to three highborn young ladies can be a challenge – in a single week she finds herself hiding in a closet full of tubas, playing an evil queen in a play and tending to the wounds of the oh-so-dashing Earl of Winstead. After years of dodging unwanted advances, he's the first man who has truly tempted her, and it's getting harder and harder to remind herself that a governess has no business flirting with a nobleman. Daniel Smythe-Smith might be in mortal danger, but that's not going to stop the young earl from falling in love. And when he spies a mysterious woman at his family's annual musicale, he vows to pursue her. But Daniel has an enemy, one who has vowed to see him dead. And when Anne is thrown into peril, he will stop at nothing to ensure their happy ending." The story is wrapped up in a mystery. Daniel has enemies but so does Anne. Part of the mystery and the story is finding out who is after whom. It did make for a good plot and it kept the story moving. Daniel and Anne are both nice characters and their story is entertaining. That said I did not enjoy this story as much as I did the first one in the series, Just like Heaven. It still was fun to see all of the familiar characters again. A Night Like This is a pleasant read and fans of historical romances and of Julia Quinn will enjoy it book. I will be looking for the next book in the Quartet. I do like the Smythe-Smith family and their musical. 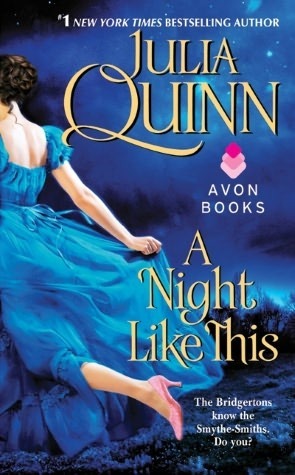 Avon published A Night Like This by Julia Quinn in 2012. I just got the ARC of Dream Lake by Lisa Kleypas from Amazon Vine this week. This is book 3 set in Friday Harbor (from the trilogy of the same name) and is Alex's story. I started it late last night and so far so good. Here is the beginning. "The ghost had tried many time to leave the house, but it was impossible. Whenever he approached the front threshold or leaned through a window he disappeared, the some of him dispersing like mist in the air." The ghost is a new addition to the series and this makes me wonder what part he plays in Alex's story. Along Came a Duke is one of the books I got from Amazon Vine this month. I like books by Elizabeth Boyle and this one is no exception. A lesson Tabitha Timmons, a penniless spinster, has never needed to heed. That is, until she is left a vast fortune payable only upon her marriage to the very respectable Mr. Barkworth—a match that offers little chance of discovering exactly what her aunt means by "untoward attentions." But the same can't be said when the Duke of Preston happens along Tabitha's path. He spies a rebellious streak in her that matches his own and he makes it his mission to save her from such a passionless match, interfering in her life at every turn. All too soon, Preston—whose very name spells ruin—has Tabitha caught between the good fortune that guarantees her security,and his kiss, which promises an entirely different kind of happily-ever-after." This has quite a few laugh out loud moments in it. The two main characters are wonderful. Preston is that mixture of rogue and enduring little boy that women love. He doesn’t know it but he has been looking for a way to go home since he was six and with Tabitha he finds what he has been looking for. Tabitha or Tabby as Preston calls her has not had an easy time since her parents died. She is strong but feels trapped by everything that is happening around her. Even when it looks like something good has happened she is not in control. It takes Preston to break her out of her situation. I loved the side characters. There are four who are slated to be the main characters in the next two books. They were very well developed. Another well developed secondary character is Tabby's dog, Mr Muggins. He play a key role in several scenes. The plot was predictable but the journey to the HEA was a lot of fun. Boyle put in enough twists and turns to hold my interest. Along Came a Duke is a good start to a new trilogy and I look forward to the next two books. 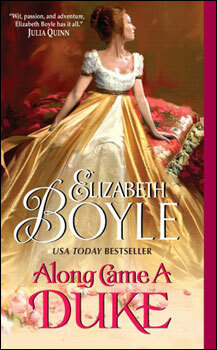 Avon published Along Came A Duke by Elizabeth Boyle in 2012. I am waiting for A Gentleman Undone by Celia Grant. It is due to be released on May 29th, 2012. I loved her first book A Lady Awakened and have high hopes for this one. Lydia Slaughter understands the games men play—both in and out of the bedroom. Not afraid to bend the rules to suit her needs, she fleeces Will Blackshear outright. The Waterloo hero had his own daring agenda for the gaming tables of London's gentlemen's clubs. But now he antes up for a wager of wits and desire with Lydia, the streetwise temptress who keeps him at arm's length. 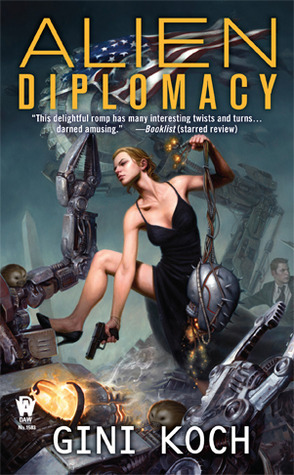 My teaser today is from Alien Diplomacy by Gini Koch, the next book on my TBR pile. This is from page 17. "Fluffy purred loudly while I petted it and relaxed a little. The Poofs had been among the cool thing we'd gotten during Operation Invasion, or as others insisted on calling it, my wedding." If it is a paper copy I look at the inscription on the back or on the cover. I sometimes read the reviews if some are printed in the book. If it is an ebook I read some of the material included in the front of the book but mostly I page through to the first page. 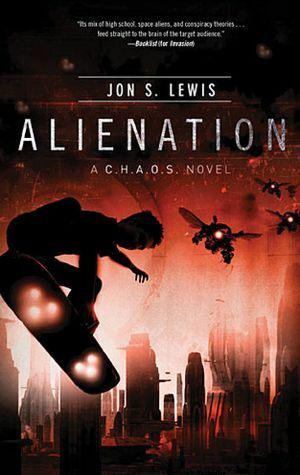 I received a free copy of Alienation (The title was what caught my attention) from Amazon Vine. This is book two in the trilogy. I have not read book one but I did not have any trouble keeping up. There was a lot of back-story dropped in small snippets throughout the book and it was enough to keep me from feeling lost. In addition, issue 12 of The Phantom Flyer, The Menace of the Thule comic book is at the beginning of the book. That let me know who was who before I ever started to read the book. Along with his best friends Oz and Danielle, Colt McAllister is now training at the secret Central Headquarters Against the Occult and Supernatural Academy. But strange accidents seem to follow him. . . even with the security of the school grounds. What first seems random soon turns deadly. But who is targeting Colt? Plot: Very fast moving. This is like many middle books in a trilogy this puts in place the elements for the next story. One problem is solved but many remain. Characters: The three main characters have a lot of action time and are well developed. I did have trouble with one of the main characters reaction to the main problem in the story. It just did not ring true to me. Several of the secondary characters are crucial to the story line. They were not as well developed. Writing: Jon S. Lewis is also a comic book writer. There is a section at the end of the book on the difference in writing graphic novels and books. You can tell he knows his craft. Everything in the book moves smoothly to a climax. This was a very fast read. The book is only 250 pages long and everything moves very fast so I started reading and did not want to put the book down. All in all Alienation was a very good book. Thomas Nelson published Alienation by Jon S. Lewis in 2011. 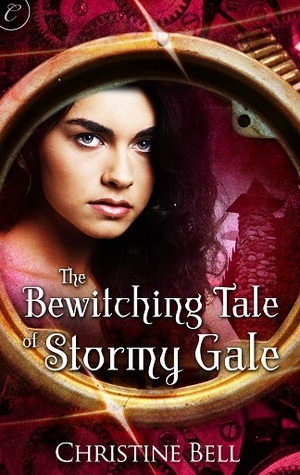 I received an ARC of The Bewitching Tale of Stormy Gale by Christine Bell from NetGalley. I almost passed on the book thinking I had already read it. This is the second book in the Stormy Gale series. 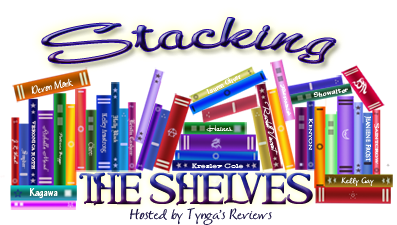 The first is The Twisted Tale of Stormy Gale and I also read and reviewed it when it came out. This is a novella length story. World Building: Christine Bell did a great job developing the world in the first Stormy Gale. That allowed her to move ahead with this story with only some hints scattered when needed. Characters: Stormy, Dev and Bacon have all grown and changed since the last story. Each is more fully developed. There are several interesting new characters introduced. I do love how the villain was disposed of. Plot: Time travel in interesting and it is used throughout the story. Stormy still is a go for it person and her personality drives much of the plot. Although the witch trials are over in Salem the aftermath is also central to the plot. Everything moves along with plenty of twists and turns. Tension: Plenty of that in the story. Time travel restricts some action causing tension. There is plot tension and additional tension caused by the personalities of the main characters. Writing: The story moves at a good pace and there is plenty of action and dialog. Everything is paced to hold the readers attention. It was fun to see Stormy and Dev again. Seeing how they had changed and stayed the same was interesting. This is another good story to pick up when you want something you can finish in a short time. Carina Press published The Bewitching Tale of Stormy Gale by Christine Bell in 2012. I am trying to be so good and not get any new books until I have finished the big pile I already have so I only got one book this week and it is from the library. 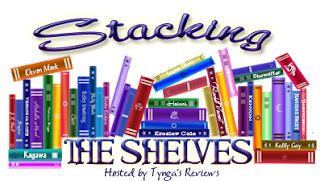 Then I read several other Stacking the Shelves posts and requested several new books from NetGalley so if I get my requests I will be adding not subtracting books next week. Here is my one book this week. Angel of Europa by Allen Steele - This is almost a short story. It is only 90 pages long. 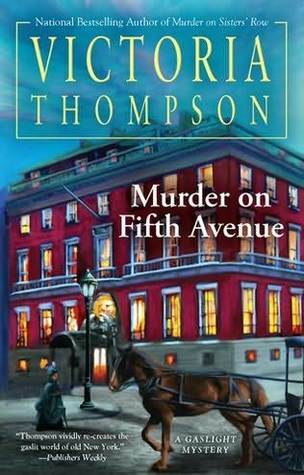 I just started Murder on Fifth Avenue by Victoria Thompson. This is book 14 in The Gaslight Mystery Series. Here is how it starts. Frank hated answering stupid questions from goo-goos when he was in the middle of an investigation." I had to keep reading to find out what a goo - goo was. I love this series and Murder on Fifth Avenue is off to a great start. Desert Blade by Ella Drake. "In the post-apocalyptic Midwest, now a ravaged dust bowl, former guardsman Derek Covington must find help for a sick boy. With nothing but memories of all he lost, Derek crosses the desert alone in search of the doctor who saved his own life ten years ago. Drifter gangs who loot and pillage don't dare come near, for Derek has a formidable weapon: a prosthetic arm with a deadly blade. For a decade, Dr. Lidia Sullivan has fantasized about the handsome guardsman who'd been in her care. And now she can't deny his dangerous request. But as they make the treacherous journey back to Old St. Louis, they must contend with much more than fierce desert winds and their unthinkable attraction. A fearless gang has spotted Lidia—a rare woman—and will fight Derek to the death to get her. And though he risks his life to save her for the sake of the child who needs her, she fears there's one thing Derek will never risk: his heart." Plot: The plot is familiar. The two main characters meet and separate in a America that has fallen apart. Ten year later they must work together to bring help to people who have no medical support. The journey brings back feelings that never were acknowledged in the first meeting. Characters: This is a short novella and as a result there is just a minimum amount of character building. The two main characters are somewhat fleshed out. Side characters are pretty one-dimensional. World Building: Ella Drake has created a unique situation that explains why the World has fallen apart. Tension: Most of the tension comes from the outside in this story. While there is some tension between Lidia and Derek it is resolved pretty quickly. Writing: The story is tightly structured and moves smoothing from scene to scene. Ella Drake uses her writing skills to build a good story in an unusual world. Desert Blade is worth the read. It is a good story to pick up when you don’t have the time to finish a long novel. 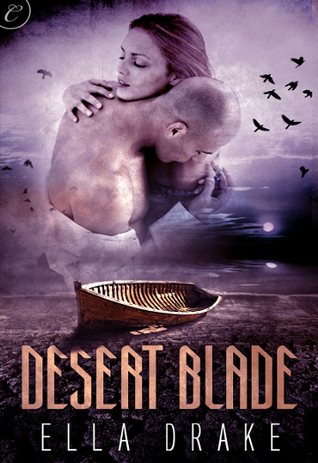 Carinia Press published Desert Blade by Ella Drake in 2012. Julie Charlton is at the breaking point. She's overwhelmed and burned out,and in today's unrelenting society, her kids are, too. 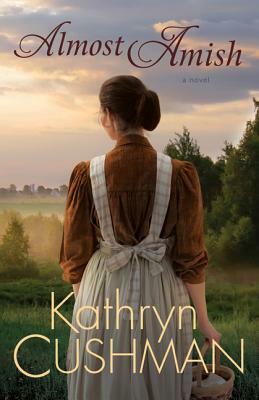 When her sister-in-lawSusan, a Martha Stewart-in-training, lands the chance to participate in a reality TV series promoting simple living, and needs another family to join her, it seemslike the perfect opportunity. The location is an idyllic farm outside an Amish community in Tennessee. Julie, with her two children, joins Susan and her teenage daughter for a summer adventure. Susan needs to succeed in order to become self-sufficient after an ugly divorce, Julie needs to slow down long enough to remember whather priorities are and regain a sense of purpose and meaning. It becomes clear from the start that "living simple" is no simple matter. With the camera watching every move, Susan's drive for perfection feels a lot like what they left behind, while Julie suddenly finds herself needing to stand up for slowing down. With each new challenge, their season of "going Amish" gets more and more complicated, as each woman learns unexpected lessons about herself and her family. I began Tera's story ten years ago as a project towards a graduate degree in writing. When I finished, I sent it out to a few publishers, and amazingly, they even got back to me. This does not happen a lot to unpublished writers without agent representation, so as I was dancing in the street, I envisioned a fat publishing contract, followed by a straight journey to the top of the bestseller lists. Of course, I would have been equally happy with someone willing to print just a hundred copies of my book. I just so wanted to see the story in print and hold my very own book in my hands. Reality brought those dreams to a screeching halt. The editor-in-chief at a major NY publishing house really liked the story, but told me it wasn't exactly what they published. Another editor at another house told me she wasn't sure how to sell it to her marketing people, but she loved it too much to reject it. Many years later, I still haven't received a rejection letter from her. Yet, another editor at a big publisher read the first three chapters, loved them and requested to see the rest of the book. By the time I sent the full novel, she moved on from her job. I'm guessing you have picked up on a pattern here: lots of love, no contract. In the meanwhile, I wrote other projects and became successfully published in a whole other genre. But I never forgot THE THIRD SCROLL, and neither had some of the people who read it. From time to time, I would receive an email from a friend who read the manuscript when I wrote it, telling me they were still thinking about the characters, asking when the book was going to be published. 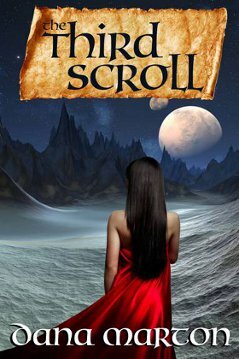 Well, with the advent of direct publishing, THE THIRD SCROLL is now on its way to readers finally. And I'm back to dancing in the street. I would so love to know what you think of Tera's story. I hope you'll think it was worth sticking with for ten years. "I placed them into the infected wounds and bandaged over them, not too tight so they could breath." "The wound, good living flesh, I cleansed once again and treated with an herbal poultice that warded off further infection." I am reading this on my Kindle and am 18% into the book. So far it is keeping my attention and I am enjoying the story.